A lot of gluten free baking experiments happen around here. If you haven’t noticed them, it’s because a good many of those trials never become post-able recipes. I’ll say it (and I won’t be the first!) – gluten free baking is hard. I know many of you are pros, but for the rest of us, it can be frustrating and not to mention expensive. Today, I’m here to relieve you of all of your internet-flour purchasing by saying: just buy a pre-made flour blend. One bag, and you’re done. Because summer (to me) is about skillets, I made chocolate chip cookies in cute little mini skillets. If you don’t have mini skillets, you can use little ramekins, or bake the dough in a larger skillet (or a glass or ceramic dish) and slice them into bars. Also (because it’s summer), we indulged and smothered these with ice cream and chocolate sauce. Use an electric mixer to mix coconut oil, sugars and vanilla until smooth. Add egg and mix until well combined. In a separate bowl, combine the dry ingredients, then mix (a little bit at a time) into the wet ingredients. Mix on high for a minute or until well combined. Stir in chocolate chips and pecans. Separate the cookie dough into 6 equally shaped balls and press them into 3.5-inch mini skillets or similarly sized ramekins. Bake for approx. 12-14 minutes. Remove them from the oven when they're slightly underdone in the middle. 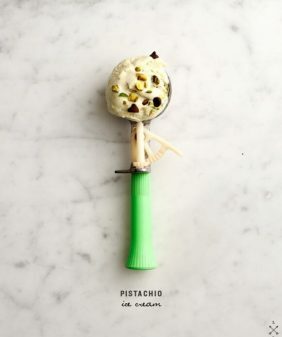 Let cool and serve with ice cream if desired. You can bake these in a larger skillet, adjust baking time accordingly. Let cool and slice pieces to serve. (You can also bake these as regular cookies on a cookie sheet). A note about coconut oil: if yours is melted to begin with, pop it in the fridge for a bit to harden. I used these Mini Skillets. That looks incredibly delicious and we are all very grateful for the trouble you go to to create something wonderful! These couldn’t be cuter! 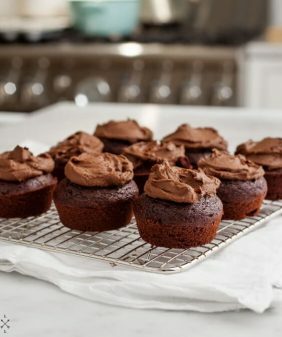 And yum, they look delicious! ohmygosh those are the cutest little baby skillets in the whole wide world! How lovely! I basically want to eat my computer screen, but I think that would be taboo in my workplace. Dang I got rid of my baby skillets. What a wonderful idea. The gluten free is a great way when you are cooking for an unknown group. Seems like these days someone is gluten free. It feels good to have a cake that is inclusive for all. Oh my word, can’t believe these are gluten free! Hello! These look amazing! I don’t have any baby skillets….could I make them in ramekins? Thank for the recipe! These look so lovely! 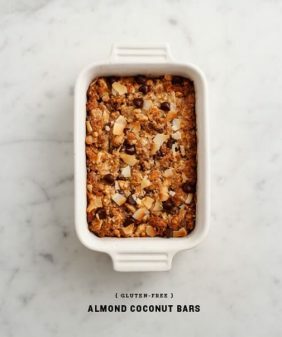 I hardly ever bake gluten-free because it is so hard to get it right, but this looks like something I could succeed with. I love the mini skillets! Oh these look divine and I agree – summer is all about skillets and…decadent desserts like this one! I haven’t done too much gluten free baking, but I would imagine it is difficult to find the right balance of ingredients. These little skillets are adorable!! I love skillet dishes too and this looks delicious. Your quick skillet apple crisp is a favorite of mine, and I’m sure this one will be too. I’m assuming light spelt flour or whole wheat pastry flour could safely be substituted if gluten-free is not a necessity? yep! the recipe will work with either of those subbed in 1:1. And it did work. Made them with whole spelt flour and they are wonderful. 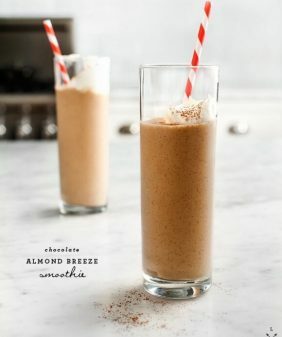 This recipe is another keeper Jeanine! STOP IT! These are just adorable. I don’t know what I want more, the cookies or those adorable little skillets. SWOON! I’m such a fan of Pamela’s for those quick midnight cookie emergencies! I love these mini skillet cookies – yum! ha, I can relate – when I need a cookie, I need one now! 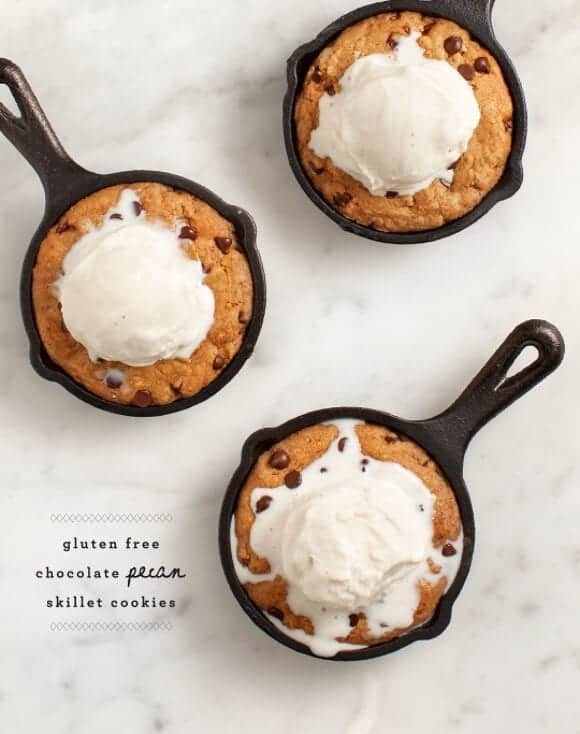 i’ve had my eye on those mini skillets for a while now…i may have to get them just for these cookies! Hi, I know of a local store that carries your mini cast iron skillets. The only problem I have is they sell a lot of them in different diameters. Can I please get the same diameter skillets like yours so that I too can create your yummy recipe? Thanks in advance. 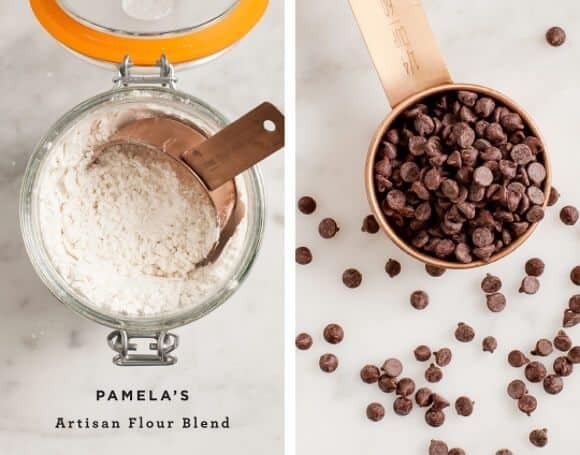 Can you swap All Purpose Flour for the Pamela’s Artisan Flour Blend if you don’t have a dietary need? Could you use Pamela’s Baking and Pancake mix in these? Would you just omit the baking soda and or baking powder? 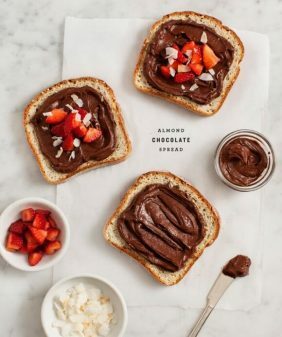 Hi Shannon – just wanted to follow up – I tried this recipe with Baking & Pancake mix (without baking soda or baking powder – because, as you know, they’re ingredients in the mix). It worked as regular cookies, although they flattened out quite a bit and are more delicate (although still delicious). The skillets didn’t work as well as they did with the Artisan Flour Mix. (not enough rise). I’ll have to test this a few more times to figure out the proper baking powder ratio. Also – if you make cookies with the Baking & Pancake mix – don’t add salt because there’s already salt in that mix. Could you use an egg replacer instead of the egg? Hi! This is really urgent, please answer asap! 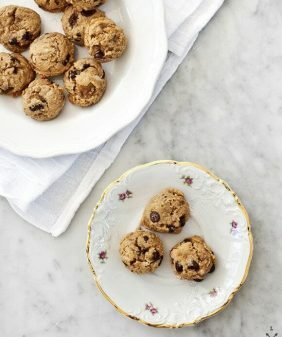 I want to make these skillet cookies but I don’t have a flour blend. Is there any other way I can make these? It doesn’t have to be gluten free. Any kind of flour will work!!! Please answer ASAP!!! i never ever comment on blogs, but i just wanted to say thank you for sharing your simple and delicious recipes with the masses. 🙂 i made these last night in my little le creuset cocettes that i don’t get to use often enough and they hit the spot. i’m wondering why they tasted exactly like warm chocolate chip banana bread? mmm…i don’t really care. they were great. thanks! I’m feeling so full of cold and sorry for myself today, so I made this recipe for some comfort-food-sofa-time – It’s just PEFECT!